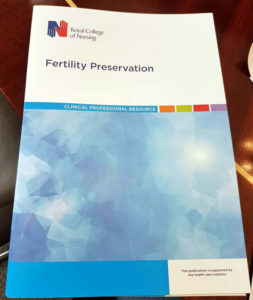 RCN guide to fertility preservation is a new publication from the Royal College of Nurses (RCN). The RCN was concerned that the fertility preservation is often not discussed openly and the publication explains that children are also able to preserve their fertility and that parents should be given the opportunity to consider this option. The new publication was launched by Jane Denton CBE at #RCNfertility17. It is a clinical professional resource that provides information for nurses who are supporting and caring for those beginning treatment for potentially life-limiting diseases; where the treatment may adversely affect their ability to have children in the future. Although the most common reason for fertility preservation is ahead of a medical procedure that may damage later chances of conceiving naturally, it can be used for social reasons. Over recent years Bourn Hall’s embryology department has supported multi-disciplinary teams involved in gender reassignment of young adults, where collection and storage of gametes occurs before hormonal or surgical treatment. The publication also includes advice for supporting those who may wish, for non-medical reasons, to defer having children until later in life, for example members of the armed forces. Fertility preservation, the collection and freezing of eggs and sperm, offers the chance for individual to use those gametes later as part of fertility treatment. For some conditions natural fertility is regained but storage in advance of treatment provides a type of insurance policy, that although not guaranteed provides the opportunity for treatment. The RCN say that it is important that registered nurses understand the reality of what is possible now, what may be available in the future. The RCN decided to take action because despite a recommendation from NICE (National Institute for Health and Clinical Excellence) four years ago that the impact of cancer and its treatment on future fertility should be discussed between the person diagnosed with cancer and their cancer team, this hasn’t been happening often enough. Jane Denton is Director of the Multiple Births Foundation (MBF), a former member of the Human Fertilisation & Embryology Authority and a founder member of the Royal College of Nursing Fertility Nurses Group. Jane has wide experience of the clinical, scientific and ethical challenges presented by the advances in reproductive technologies. She has contributed to substantial change in public and professional attitudes towards multiple births, and was awarded a CBE in 2007 for services to nursing and healthcare. For fertility preservation at Bourn Hall, click here.